Braintree, MA (August 19, 2016) – Hingham resident Eugene Mattie recently completed a summer internship at full-service real estate firm Peabody Properties, Inc. Mattie, who hopes to explore the real estate accounting field as a career option, served as the intern for the firm’s information technology (IT) department. The 19-year-old will graduate in 2019 with a Master of Science in accounting from the Isenberg School of Management at the University of Massachusetts, Amherst. 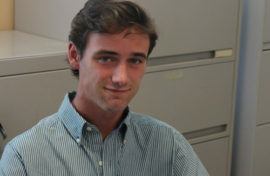 Over the course of his internship, Mattie was introduced to the firm’s computer technology system, configured various computers and coordinated information collection programs throughout the company’s workstations. He also organized and sorted the firm’s IT equipment deliveries and shadowed the Management Information System (MIS) Administrator at local job sites. Mattie was able to apply his former IT knowledge to various situations in the firm, while expanding his understanding of different computer systems. “Through my internship I’ve learned that I can take my accounting skills and apply them to a wide range of services. The experience I’ve gained during my time at Peabody Properties has sparked my interest in real estate accounting and I look forward to what the future holds,” said Mattie. According to Mitchelle Frederick, Corporate Recruiter at Peabody Properties, Mattie was a valuable addition to the Peabody Properties team who contributed his skills to many IT projects. “We were thrilled to have Eugene working with us this summer. We value the energy and infectious enthusiasm that our interns bring and we know how important it is for young people like Eugene to gain real-world insights. We are committed to growing our internship program so that students can learn, lead and grow,” said Frederick.